Get to know more about our HFF staff! Check out the Voyage Houston article featuring HFF Ray, host and commander-in-chief of Houston Film Fanatics! Today we’d like to introduce you to Raylynne Perez. So, before we jump into specific questions about the business, why don’t you give us some details about you and your story.Promotions and film have always been my passion. I spent a good portion of my early teens working doing promotions and guerrilla marketing for bands and concert venues all over Houston. 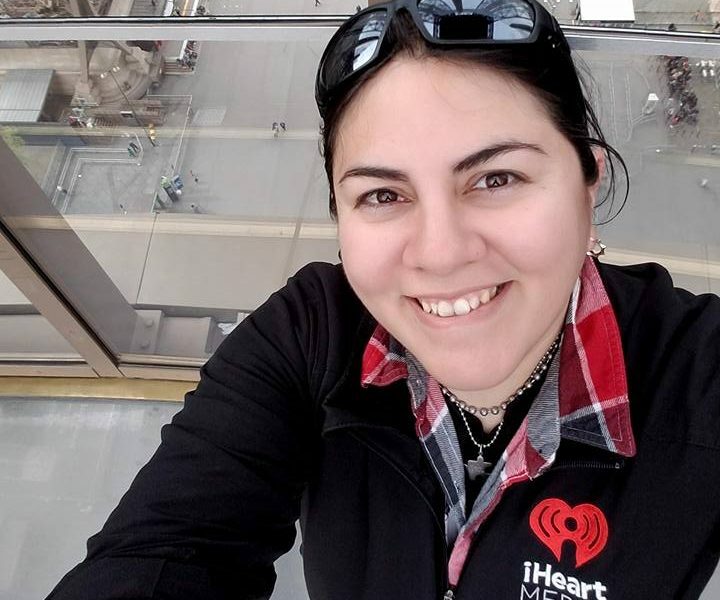 After years of working promotions on a much more underground level, in 2005, I took a job as a promotions assistant with Clear Channel Radio (Now iHeart Media). I spent several years covering events all over the city from our big Buzz fest concerts to store grand openings. I spent a lot of time juggling school and work at that time and wanting to branch out to be able to promote my own passions which are film and TV. in 2011, I founded the Houston Film Fanatics with a couple other coworkers of mine at iHeart. I wanted to have a movie group that not only could be a place people could win access to free screenings, DVD’s and movie swag, but also a place that when they read reviews it felt like they were having a conversation with their own friends and less like an uptight critic review that many frowns upon. In 2013 I was promoted to the Assistant Director of Promotions and Marketing. Since then I have been growing HFF to the successful group it is today along with managing a successful promotions crew. Overall, has it been relatively smooth? If not, what were some of the struggles along the way?It has taken a lot of work to get to where I am today. My department is small so competing for my job when the position opened was pretty nerve-wracking. I always feel like my work is a reflection of myself so I have always strived to give 100% of myself to whatever project I am working on. Luckily many people along the way saw how passionate I was about what I was doing and how much I put into it and got the job. HFF has been another story. It is almost like having another full-time job in itself. I run the website, social media posts, blog pages, edit all the videos, record and edit our podcast, arrange the interviews so it takes a lot of time, but it is 100% a labor of love. Alright – so let’s talk business. Tell us about Houston Film Fanatics at heart Media – what should we know?iHeart Media, better known to the masses as iHeart Radio, is one of the largest Media companies in the country. under that umbrella, we have 7 local Houston Stations (Sunny 99.1, 94.5 The Buzz, 93.7 The Beat, 104.5 Kiss FM, Sports talk 790, News radio 740 KTRH, and KPRC 950) and a huge network of stations all over the country thanks to the iHeart Radio App. I manage our Houston promotions crew/street team, work with salespeople and clients to set up appearances, and handle a lot of the giveaways we do for all our stations. I also run our in-house movie group The Houston Film Fanatics and act as an entertainment reporter and host for our stations via HFF. With HFF we want to be seen as just your average movie buffs and not typical critics. We understand that not every movie we see is going to change our lives and sometimes it is just about the pure simple joy of escaping reality for a couple hours. When people check out the reviews or listen to the podcast we want them to feel like they are listening to a couple of their friends discuss a film and not some stuffy critic. It is all about having a good time. HFF is my passion and it is something I want to be able to share with as many people as possible. Any shoutouts? Who else deserves credit in this story – who has played a meaningful role?I have had an amazing group of supporters here at iHeart which have helped me grown and get where I am today. First, I have to give love to my former boss and HFF original member Conrod Thomas. He is the one who helped really lay down the groundwork for HFF and make it a possibility by getting our digital team onboard and bringing myself and our other co-worker Nicole Janson together to make this a reality. I also have to thank my bosses Melissa Brezner and Rob Skinner who has helped with a lot of not only my grown and knowledge with the iHeart but who have also helped push HFF even further along. I don’t think we would be as successful as we are without them, I also have to give a HUGE thank you to Marie Cervantes who has been my partner and crime with a lot of our HFF work. She has acted as a great co-host and stellar video/photo editor for many years now, whether we are working 18 hours days at film festivals or covering one-on-one interviews downtown she has really been a huge help and asset to this team. I also have to give a lot of love to Robert McKinley, Noe Rodriguez, Dillon Sievers, and Carter Rodriguez for all the help they have given recording podcasts, helping with social media, juggling all the insanity at movie screenings and writing reviews. They are a hell of a team. My mom Linda Perez, and sister Shelley Rodriguez who have always chipped in where ever they can with getting merchandise made and been the best cheerleaders a girl could ask for. Lastly, my wife Wendy who loves me despite all the long hours and late nights and who lets me drag her off to one silly screening or show. She is my rock and has been the best support system I could ask for.